Oh spring fever, why do you do this to me? Good morning friends, yes I am working on some things in the background but I won’t deny that the coming of spring is a detraction. So today is a short post and hopefully I’ll have some gift items to celebrate Easter soon :-) Please hang in there with me – I hesitate to say what I’m working on because sometimes it takes me a bit to get things off the ground. Today I’m sharing a card that when made, I had the hope it would speak to the receiver. That’s what we do when we make cards right? I’m all about picking the perfect sentiment so that when it held in their hands, inspires them and reminds them of something important. I’m a huge fan of shaped cards because of the ease! You have many of these dies in your stash but if you don’t there are likely substitutes you can make – for this one I used Spellbinders Grand Labels Four. For the focal combination on this card I used Spellbinders Labels Twenty on top I layered Spellbinders Radiant Rectangles and finished with a smaller label like Spellbinders Labels Fourteen or Spellbinders Labels Eighteen. From the huge stash of cards I’ve created, I decided to share them with readers rather than let them sit and age. It’s a great review of some of the tools we might not have used in a little bit. It happens every Friday, where I give away a card to a randomly picked reader who leaves a comment in our conversation about a thought provoking prompt I dream up to discuss – here’s a link to my FAQ’s just check out #11. For your comment today – There are so many delightful things around us! If you could bottle up anything in your day today, just to keep it, what would it be? I’m brimming with creativity – I just wish I could move quicker!! Thank you so much for stopping by – I truly appreciate it. I’ve missed talking to you all but have a catch up post soon! The spring flowers!!!!! So beautiful and delicate, but for a short time only. 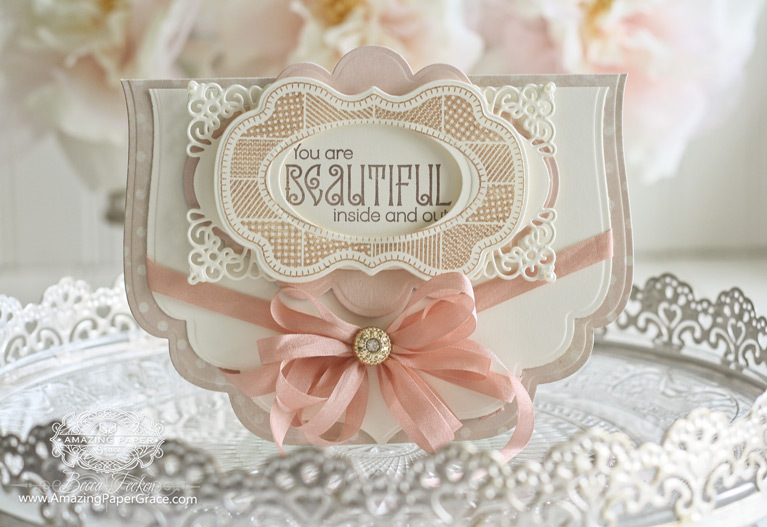 You card is beautiful Becca….I agree with you that Spring is inspiring!!!!! Thanks for sharing. Oh my Becca, this is one of my favorites. So perfect for spring, love the melon color with the brown and the shape is delightful for your embellies! If ever I would like to win, it would be today!!! I would certainly “bottle up” the azeleas that are currently in bloom here in Florida. I absolutely love this time of year here, don’t you? Have a great week Becca and you have our attention for what you are going to come up with next. I think just the beauty of the day God has created. What a lovely card. I, too, love shaped cards and I’ll be sure to make something similar as I have dies that would work very well. The sentiment made me smile. My Mother is 104 and is dying. If I could bottle up her essence I would scoop up a portion of love and portions of discipline, humor, love of reading, brilliance on how she continues to do the crosswords and her smile. Gorgeous card! I love the shape and the layering! Wha a gorgeous card, Becca. It is such an inspiration because – you are right – I have all of these dies but have never put them together in one card. Thank you so much for sharing it with us! Good morning Becca, wow fabulous card!!! If I could bottle anything today it would be my beautiful grand daughter she’s 28 months and a ray of sunshine!!! Oh happy days!!! Another beautiful card Becca ,I would bottle up today the hope and positivity my son has that he has not got Cancer. Praying that your Bone test favors your health, too. God bless! Prayers coming your way that you are free and clear. Thank you for the hugs for me on my dying Mother. You are so thoughtful to let me know you care. I would bottle up all that beautiful sunshine that is giving me so much energy today. I would let a little bit out every day of my life. Love sunny days. If I could bottle up something to keep, it would be the feel of my granddaughters’ kisses and cuddles. Today, I would’ve definitely bottled up the glorious sunshine we had. Do I enjoy your card today! Beautiful. Thank you. Morning Becca, your card today does speak volumes and this is what I would bottle up the comments some friends say and just the fact that they are friends. also I would bottle up the joy I have when my family is all here. You never fail to create something beautiful Becca, I try to make my creations suit the receiver as well, their joy of receiving something returns to me as I get as much out of making it and giving, as they do in receiving. it would be the wonderful time I had today with 3 other stampers. I love everything about this card. The font for the sentiment is unusual and so delightful. In reading over the comments of others, sunshine was high on the list of appreciation but in S. California we are getting some much-needed rain – liquid sunshine! Earlier, the rain was falling so gently it gave me a sense of peace – that’s what would fill my bottle today. As seasons change, it reminds me that things come in their own time. Thank God! Hi Becca, beautiful card today. If I can bottle anythimg up it would be all the kisses & cuddles, I ever got from my kids. They seem to be rare as they turn into teenagers! Just arrived home from shopping and much to my delight our group of yearling deer were gathered in the front yard. It makes me so happy to see nature’s bounty . . . That’s what I would bottle! Today I would bottle up….my husband’s love. He retired a week ago, and I love having him at home with me. Our son is still at home while he finishes up school for another year +, but it is so nice for Kent to be here, too. We both married late (first time for both of us) and I’d adopted the kids already, so we’ve had little time just us together. Life is good! Lovely card today…love the tan and taupe together…and the message. I would bottle up spring to keep throughout the year. Open in the heat of the summer and feel the coolness of spring. Of course in winter I would open the bottle with the cold and darker days and feel the newness of spring and the promises of the flowering trees and flowers. If only we could bottle spring. Beautiful card today but then all your cards are beautiful! Your card is beautiful and I really do not have an answer for your question. I am permanently disabled and in a lot of pain (nothings helping). floor how good is that!! I really love this shaped card. Shaped cards just say you are special and of course your cards always say that and always are so unique and gorgeous. Due to my daughter’s and son-in law’s ever changing work schedule, I am often asked to go over and get my twin granddaughters up and ready for school and then drop them off. That was the case this morning. If I had to bottle up something from my day, it would be all the excitement, joy, and energy that all the kids have when arriving at school today. I never get tired of seeing it in their eyes and in their laughter. Another fabulously beautiful card that I would love to CASE some day!! Thank you SO much for giving us a chance to own one of your beautiful creations! This is a gorgeous card Becca and I do have this die don’t remember when I last used it must try this one. If I could bottle up something I think it would be the beautiful crisp mornings we are having at the moment. Well what i would bottle up but it would need to be some size of bottle though is my beautiful hills when the sky has some soft red rays running across it, the clouds are wispy and just about there but so fine that you can see through them, the ground is so fresh and alive looking and i can see right across to the Wallace Monument at Causewayhead, Stirling. I am so very lucky to be able to enjoy this beautiful scene from my windows or the end of my road. Can you tell i’m an avid lover of my home country and the beauty that it holds for all to see if they would only look. So yes i would need a rather large bottle Becca to keep certain moments of real beauty intact. Your card today reminds me of a bonnie shaped handbag or clutch that you could go to something nice with like a wedding or a special night out. Thank you Becca for once more showing us your gift of talent. this card could have been made for you! It’s absolutely gorgeous and you’re right, I must use my dies (especially the GRAND ones) more to make card bases. I love what you have done here and the colours are simply beautiful. What a beautiful card. Stunning actually. What a thought provoking question ~ I would bottle up my family’s love so I would have it for a lifetime! 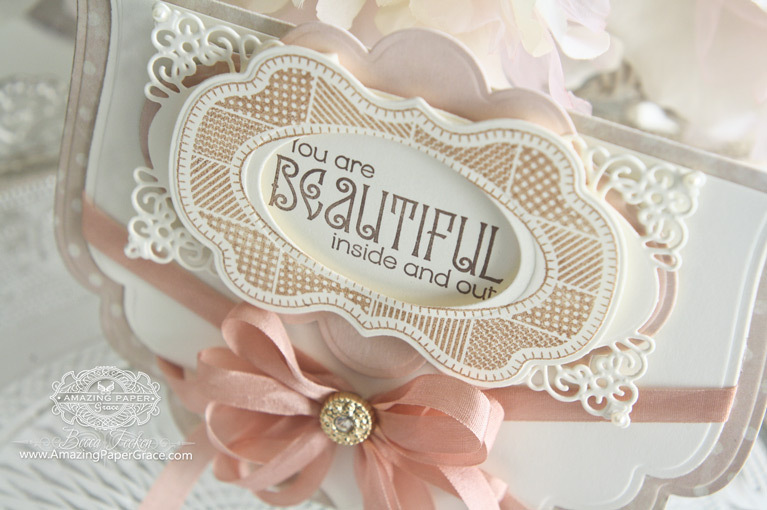 Hi Becca, Lovely pastel colours, lovely die-cuts, a beautiful sentiment and a stunning bow. I love it !! If I could bottle something, it would have to be ‘sunshine’, as it uplifts my spirits and everything seems much better when the sun shines. If I could bottle up something in my day today it would be all the love I receive from my grandkids. Hello Becca! I hope you are enjoying your day. Your card is so soft and elegant. I love shaped cards too and just happen to have all the dies in my stash. I definitely need to give a try at creating my version of this. I’ve always loved the Grand dies from Spellbinders and have quite a few sets. They do make lovely cards. I wish Spellbinders was still releasing new versions. The other alternative would be to use a shape cut with an electronic die cutting machine. I enjoy doing that also but Spellbinders is still my favorite die company. I also believe the sentiment is super important.I wish companies would create sentiments with a short sentiment for the outside and one or two stamps with multiple verses to go with the outside sentiment but for the inside of the card. This would allow us to create sentiments both inside and outside. Perhaps one day we’ll be blessed with a line of stamps from you and Amazing Paper Grace. If I could bottle up anything today or any other day it would be the love of family and friends. Love is after all the most important thing in life. I really admire your talent and generosity and thank you. Oh my! What a stunner! Love everything about this card – and what a sentiment! If i could bottle one thing from today, it would be the precious time we spent with our loved ones! Such a blessing. This morning I have my grandchildren over…I would like to bottle up the memories of times shared with them when they are this young as they grow up way too fast……. The “family” bed when my husband and I are joined by my daughter and dog while watching a movie or tv show and then all fall asleep together is my “happy place” moment. This I would love to bottle for a life time of happy memories! Thank you for letting me feel happy by thinking of this just now!